I have spent more than six years and three tours of my health care career living and working in the Kingdom of Saudi Arabia. Saudi Arabia is a country that is modern and on the move but yet it is still very deeply involved in customs and traditions. Upon my first tour to the country I arrived in the country without an Abaya (the traditional female covering) and I was very afraid and uncomfortable … as everyone stared at me. When I went to the hospital and was introduced to my Saudi boss, the first thing that I did was reach out to shake his hand, something that is a custom in the United States, but he would decline. These were two of the very first things that I would learn about Saudi culture but indeed there would be many more customs and traditions that I would have to get use to. Saudi Arabia is a very interesting country to live and work in as you will learn something every day. 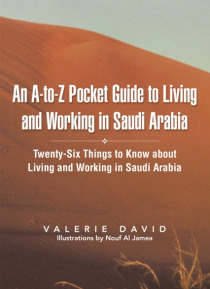 This book is a simple and informative guide to assist those who are interested to live and work in Saudi Arabia. Learn about the culture and traditions and what life is like for the expatriate that works in the Kingdom. Join me on an awesome journey and be intrigued.